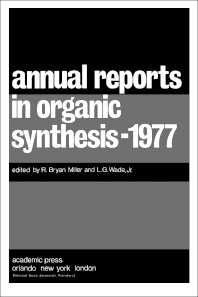 Annual Reports in Organic Synthesis—1977 presents an annual review of synthetically useful information that would prove beneficial to nearly all organic chemists, both specialist and nonspecialist in synthesis. It should help relieve some of the information storage burden of the specialist and should aid the nonspecialist who is seeking help with a specific problem to become rapidly aware of recent synthetic advances. In producing this volume the editors abstracted 47 primary chemistry journals, selecting useful synthetic advances. All reactions and methods which are new, synthetically useful, and reasonably general are included. Each entry is comprised primarily of structures accompanied by very few comments. The purpose of this is to aid the reader in rapidly scanning the book.